There are plenty of bars that claim Ernest Hemingway as a once-upon-a-time customer. 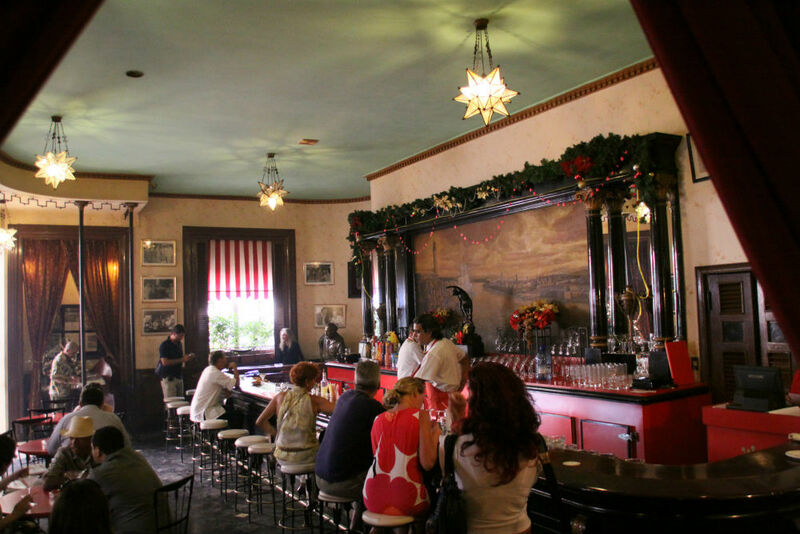 But I’ll bet that the claim of El Floridita , the bar in Havana, has a pretty good reason. In fact, the Nobel Prize winner is still there drinking at the bar – in the form of a life-sized bronze statue. There are some fabulous photographs of Hemingway on the bar’s website in the company of various locals, staff and Hollywood legends such as Errol Flynn, Spencer Tracy and Gary Cooper. Take a look- there are also several photographs of Hemingway with Fidel Castro. The bar first opened in 1817 and was originally called The Pineapple but changed its name soon thereafter. It was at the height of its fame in the 1950s when American Esquire magazine named it as one of the best seven bars in the world (why seven, I have no idea) and in 1992 it was awarded the ‘Best of the Best Five Star Diamond Award of the American Academy of Gastronomic Sciences’ and the ‘King of the Daiquiri’. The bar is also known for its seafood restaurant. Preparation: Mix all the components in the blender, for 30 seconds and pour into a cup for water. Trending Now : What's The Weather Like There?